Heat oven to 400°F. In small bowl, stir together Bisquick® mix, 1/2 cup of the cheese, the water and egg product; set aside. In ovenproof 8-inch skillet, cook beef over medium heat about 4 minutes, stirring occasionally, until brown; drain. Stir in tomato sauce, ketchup and salt. Heat over medium-high heat, stirring occasionally, until hot. Pour Bisquick mixture over top. Bake about 25 minutes or until golden brown. Sprinkle with remaining 1/4 cup cheese. Any flavor of reduced-fat cheese can be used instead of the Cheddar. Use ground turkey breast instead of the ground beef. No ovenproof 8-inch skillet? 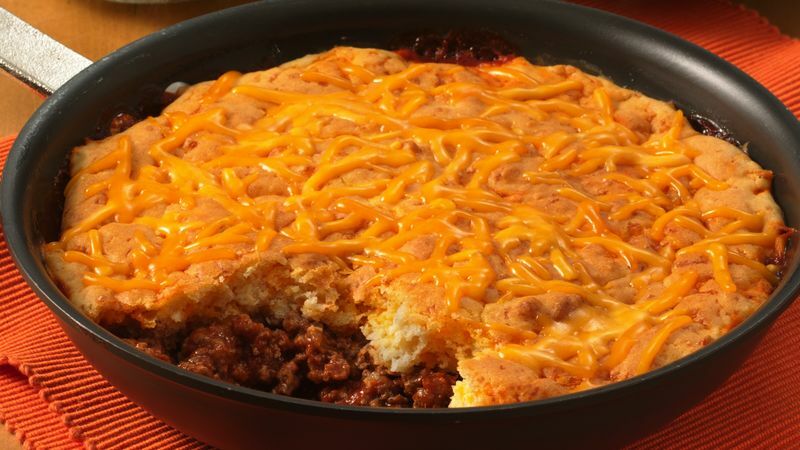 Cook the beef in your favorite skillet, then place the hot cooked beef mixture in an 8-inch round pan. Top with the Bisquick mixture and bake.